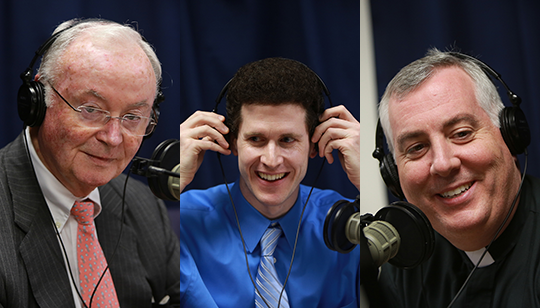 Summary of Today’s Show: Scot Landry and Father Mark examine lawyers, the role of Catholicism and civil law, and this weekend’s Gospel and 1st reading with Michael Kerrigan and Paul McNamara of the Catholic Laywer’s Guild. 1st Segment: Scot welcomed everyone and noted the topic of today’s show will be the Red Mass. Fr. Mark said that he loves the event and that he has the pleasure to be the chaplain for the Catholic Layers Guild and it’s highlight is the Red Mass. Fr. Mark noted that Cardinal Seán kicked off his campaign against the physician assisted suicide at the Red Mass last year. Scot said that Cardinal Sean’s homilies for the Red Mass are always one of his best homilies. Fr. Mark said that the Red Mass is not just for layers and that it is a regular parish Mass with parishioners, young and older layers, politicians and the media is also present which makes a great audience where the cardinal does put extra effort at to reach out to us. 2nd Segment: Scot welcomed Paul J. McNamara and Michael Kerrigan, Vice President and member of the Board of the Catholic Layers Guild and asked Paul what attracted him to the Guild. Paul said that his father was often invited to their events and he was also exposed to it while studing law at Boston College. Scot noted that both Paul and Michael are graduates from BC and congratulated them on BC’s 150th anniversary this year. Scot asked about Michael’s connection with the Catholic Lawyers Guild. Michael said that he became a member after Paul’s invitation and that he quickly learned that it is a group shares the same great values and that gives you inspiration in the work that you do. Scot asked what the priorities of the Catholic Lawyers Guild are. Paul said that it focuses on the social gathering opportunities to talk about current issues of today and how our Catholic background has an impact on these issues. Paul also said that the Guild organizes retreats, talks, day of recollection and the Red Mass. Scot asked how faith blends in to Michael’s workday. Michael said that everything can be guided by your values. Fr. Mark asked if there was a discernment process before he became a lawyer because of his faith values. Michael explained that there was a process of discernment where he attended retreats and also worked for the Massachusetts Catholic Conference as part of his discernment to see how faith interacts with public life and politics. Scot asked Paul about his preparation to become a lawyer at a catholic school. Paul said that gong to a Jesuit school helped to see that God is in all things. He said that faith is in our everyday lives and that BC helped to sharpen the idea that you should react like we are always at war and act with morals. Michael said that the ability to also participate in the society through public service was a message for him that its not “all about the Benjamins.” He also noted that it is a good connection to have and to be able to say you come from it. Fr. Mark noted that connections are very important and that the Catholic Lawyers Guild serves that purpose. Paul said it is an essential part of the guild because you have someone you can trust to connect to when you need help with a certain legal issue or just want to discuss new ideas. Fr. Mark said that the group also helps you to learn about the issues outside of what you focus on for work. Scot asked about how many people usually attend the Red Mass. Paul said that they usually have 200-250 people at the Mass and reception. He noted that the Mass is the Mass of the Holy Spirit and is open for everyone and it is an opportunity for lawyers and everyone else to ask for the guidance of the Holy Spirit and hopefully enrich our lives. Scot asked about the Young Lawyers chapter. Paul said that it is a really important part of the guild because it encourages and brings forth fresh ideas from the younger generation. He added that the guild has many aging members and that it is really wonderful to see the two generations interact. Scot asked if member can enroll before they pass the bar exam. Michael said that they can and they also give membership discounts for those who are not yet practicing. Paul said that the dues are only $50 and its mostly applied for the mailings and administrative work that needs to be done. Paul invited all listeners to the Red Mass September 30th at 11:30 at the Cathedral of the Holy Cross and noted it will also feature the Cathedral’s choir.